A tasty mix of rice, risona pasta, onion, carrot, capsicum and spices that is quick and easy to prepare, with a taste to savour. Diamond rice risotto can be enjoyed on its own or can be incorporated into a main meal, why not try making Chinese rice cakes? Rice (61%), Noodles (27%) (Wheat), Salt, Sugar, Dehydrated Vegetables (Onion, Carrot, Red Capsicum, Green Capsicum), Herbs and Spices, Hydrolysed Vegetable Protein (Maize), Flavour Enhancer (E621), Flavour, Colour (E150D), Sunflower Oil. 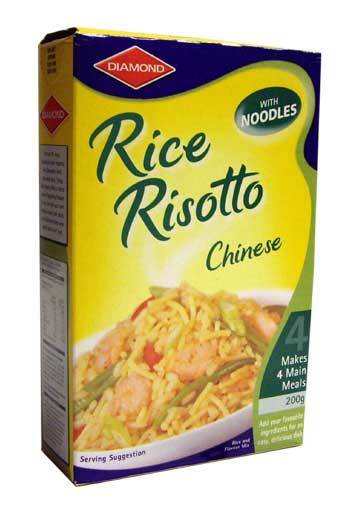 Fond memories of taking home a box of rice risotto, especially chinese flavour, as well as mushroom. Got me thru some cold nights in Roxburgh whilst fruitpicking as a student in the holidays, trying to save my money!